From impressive wildlife to intriguing culture, the UNESCO world heritage status – Halong Bay should be a prime Vietnam’s vacation spot. 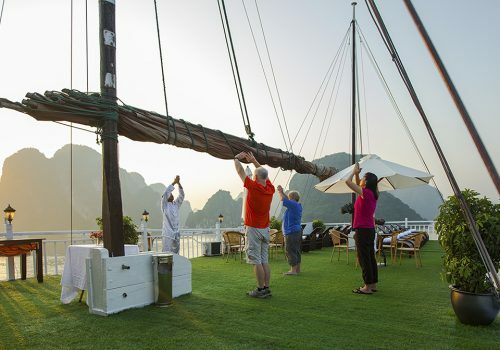 While on a visit here, you can watch sunrise from a cruise desk, get up close to the limestone formations in a kayak, snorkel alongside colorful coral reefs, or simply lounge along some of Halong Bay’s most notable beaches. Halong, what a beautiful Bay! With so much beauty, it is difficult to narrow down top 10 Halong Bay activities you should not miss in 2018! Seaplane trip is firstly for those who don’t want to waste time for transfer. It is also for those who want to appreciate the magnificent beauty of Halong Bay in a sky-high way. The good views from everywhere, but especially from a seaplane are breathtaking, with steep karst outcrops and numerous islands clearly visible. Expect to pay $650/person for an unforgettable 2-way trip from Hanoi to Halong Bay. Choose a Halong Bay cruise if you want to experience a variety of places, cultures, and cuisines. Do waking up at sea, sipping a cup of Vietnamese coffee on your desk, hours of uninterrupted chatting time, plus a wide range of interesting activities just waiting to be explored sound great? It’s high time to book a Halong Bay cruise that comes in different duration, schedule, and price ranges making it easy for you to choose. People go on a Halong Bay tour for its diverse attractions and impressive geography, but its bountiful beaches are another major selling point. Check out the fine white and blue sea and romantic landscape of Ba Trai Dao beach, find the solitude on Ban Chan beach – which is tucked away in a corner of Bai Tu Long Bay. Or if you want to try your hand at wave surfing, visit Tuan Chau beach. It is said that visiting a fishing village is a great way to see local fishermen going about their daily business. You have chance to watch out for the fish heads popping out of the water while making fishing nets with the hospitable locals. Do not forget your camera as photo opportunities present themselves at almost every corner. Halong Bay has recently earned its reputation as a foodie destination. The Bay’s restaurant scene is as diverse as its travelers with restaurants serving seafood on all Halong Bay cruises and junks. Here, you will easily find plates piled high with freshly caught fish and regional produce. As long as you are here, get ready for a taste of the local cuisine. Must-try specialties include Sam (horseshoe crab) – an arthropod crustacean, snails, Cha Muc Halong (squid patty), prawn, lobster, oyster, etc. When you need a break from the beach, let’s take part in a cooking class. A chance to expand your knowledge about the culinary culture of Halong locals in particular and Vietnamese in general. It is perfect for families looking to slow down. For a break from the sands, take a stroll or bike ride through Viet Hai Village. It is an isolated oasis kept separately from the outside world in Cat Ba National Park to visit old houses. There are various activities for you to take part in. You can meet the friendly and kind-hearted villagers, feel the tranquil and peaceful atmosphere, admire charmingly natural landscape. Especially you are able to take some striking pictures of the primary forest, sheer cliffs, deep gorges, and muddy ponds. Squid fishing is the most popular activity on Halong cruise after dinnertime. Getting ready to go out on the deck, you can clearly see light-drunken shoals of squids lazily hovering around, then contemplate the shimmering beauty of Halong Bay by night. Moreover, you have chance to experience the feeling of dropping the net like a local and enjoy your freshly caught squids in the middle of the ocean. Halong Bay’s serene water and exquisite islands make it one of the most beautiful kayaking spots on the planet. Glide the calm warm water, gaze up at the high peaks of the limestone forms, and enjoy the heavenly tranquility – kayaking will complete your dream vacation in Halong Bay. With more than 3000 limestone cliffs rising from the water, Halong Bay has incredible potential for both rope Climbing and psycho bouldering (deep water soloing). If you want to stretch your legs, climb one of more than 120 sport climbing routes on 13 crags, where you can admire panoramic vistas of this stunning archipelago of karsts. Located 105 miles from Hanoi capital city, Halong Bay tours is well known for its myriad of outdoor activities like swimming, snorkeling, rock climbing, scuba diving, kayaking. If you plan to visit North Vietnam, make sure to include a Halong Bay tour in your itineraries!